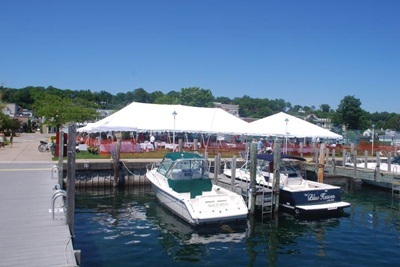 The Harbor Springs marina area is transformed into the tasting grounds for wine from Michigan, US and international wineries at the Waterfront Wine Festival, Saturday, June 25, 4-7 pm. A huge tent on the waterfront is filled with wine and food merchants so that guests can sample wines--as well as enjoy the waterfront views. Enjoy fabulous national and international tastings, wonderful samplings by local restaurants and specialty food stores, live local music, prize drawings, and more. Tickets are on sale beginning mid April; $20 in advance, $30 day of the festival and include 2 tastings, a commemorative wine glass, and food tastings. Again this year: VIP Passes that include commemorative wine glass, unlimited tastes, express entrance, and more, $50 in advance, $60 at the door. Wines will be available for tasting from vendors such as Fabiano Brothers, Kobrand, Imperial Beverage, Morgan Winery, Great Lakes Wine and Spirits, Woodberry Wines, Shady Lane Cellars, Harbor Springs Vineyards and Winery Griffin Beverage, Ciccone Vineyards, Burgdorf,and Verterra Winery. You'll be tempted by the foods of American Spoon, Crooked Tree Breadworks, D & W Fresh Market, Harbor Springs IGA, Stafford's Pier Restaurant, True North's Compass Room, Small Batch, Vernales, and more. Sponsored by the Harbor Springs Area Chamber of Commerce, the Waterfront Wine Festival is a great way to kick off the summer! Buy your tickets here: Wine Festival Tickets and click on "Register." Harbor Springs - A Northern Michigan Classic!